One of the most spectacular inaugurations 2018 takes place in Frankfurt. Read more about it in this press release as well as new from the region Frankfurt Rhine-Main. Don’t let the opportunity to tell great stories about one of the most vibrant and central regions in whole Europe pass you by. We would love to be of help. Thank you for your continued support and have blessed Holidays! The “Safe Cities Index 2017”, a report by The Economist Intelligence Unit, lists Frankfurt, the only German city in the ranking, 11th. This means that Frankfurt is currently considered one of the safest of 60 cities in the world to visit, with Tokyo being number one. Therefore, Frankfurt would be perfect for a city break in 2018, to see the results of a construction project that is unique to Europe: the new DomRömer-Quartier! 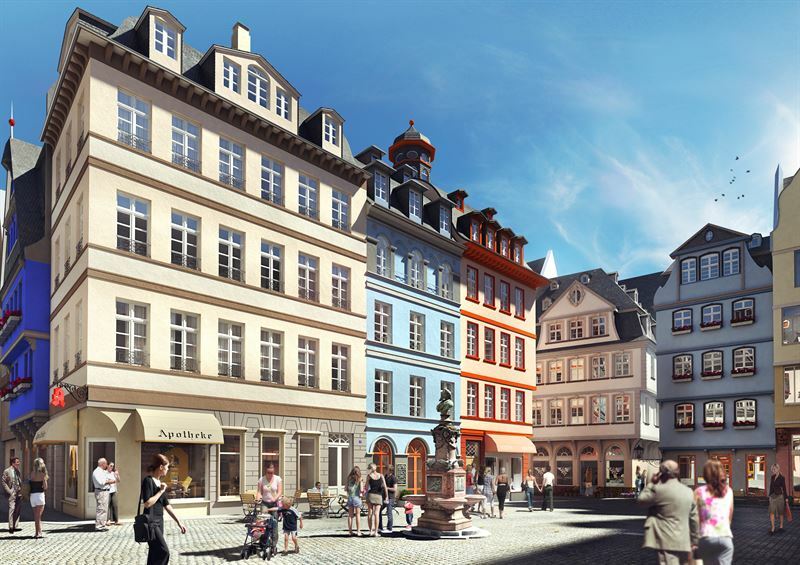 The old district in Frankfurt has been complemented with 15 new constructions (rebuilt originals) and a further 20 new buildings, including shops, restaurants, and apartments. The new old town will be completed in late spring 2018, with a grand opening in September 2018. This will be one of the most spectacular inaugurations in Europe and an absolute must-see, along with the many other features of this beautiful city on the Main. The historic city of Bad Homburg is not only ideal for the various festivals and events in the summertime, it’s also the perfect destination to recharge your batteries in the wintertime. The city has long been famous for its spa culture – one can spend the day being spoiled in a relaxing and soothing environment. Enjoy treatments with healing clay, dried herbs, flowers, and grasses, or simply a classic massage at the Kur Royal Day Spa, housed in the magnificent Kaiser-Wilhelms-Bad edifice. Linger in the thermal bath, quieting your soul and freeing yourself from the thoughts and worries of everyday life. Bad Homburg is only a 20 minutes’ drive from Frankfurt and Frankfurt Airport, making it easy to reach. It is surrounded by other highlights like the Hessenpark Open Air Museum and the Saalburg Fortress, to mention but a few. Read our fact sheet about the highlights of this region, available in the download area of this press release. “A declaration of love to the Queen of Flowers” – this is how the Bad Nauheim Holiday Planner describes Steinfurth and its 140-year rose tradition. Heinrich Schultheis reintroduced rose cultivation to his hometown in 1868, changing the history of this little village. Nowadays, two million roses are produced here yearly and a Rose Festival is organized biennially, the next one taking place in July 2018. The grand rose parade, one of the festival highlights, and a visit to the Rose Museum are simply not to be missed. Bad Nauheim is the place where Elvis Presley lived during his time in the army: the yearly Elvis Festival commemorates the king of rock. For more information about all the great events taking place here, make sure you visit the Bad Nauheim website or download the Holiday Planner available in the download area of this press release. The Frankfurt Rhine-Main region in the heart of Europe is a region of contrasts, hidden gems, and famous locations like the Rhine Valley. It has something to offer for all ages and all interests. We have developed a fact sheet with a collection of the finest events in 2018 for your enjoyment: access it in the download area at the end of the press release. If there is a specific topic you would like to learn more about, please do not hesitate to contact us directly. Don’t let the opportunity to tell great stories about one of the most vibrant and central regions in whole Europe pass you by. We would love to be of help. Thank you for your continued support and have blessed Holidays! Our amenity card (launched on March 1, 2017) helps you discover the region for next to nothing! The RheinMainCard offers attractive discounts at more than 60 recreational and cultural establishments, simultaneously providing holders with free and unlimited use of the Rhine-Main Transport Association (RMV) facilities throughout the entire RMV network. The RheinMainCard is available as either an individual ticket or a group ticket (22€ for individual travelers and 46€ for groups of up to five people) and is the perfect way to experience the region at great value for money. From January 2018, the RheinMainCard will be even more comfortable to purchase through the possibility of print@home. Read more about the conditions and the points of sale here. Did you miss any recent press release? Don’t worry: just visit our press room to download our latest press releases and photos free of charge.